Indian Hill in the rear of the former Star Mill was throughout much of the late 19th and early 20th centuries a noted location for sledding and toboganning in winter, attracting both neighborhood children and adults. 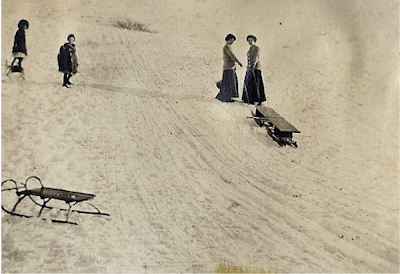 Among those who enjoyed the recreation there were Rose Standish Pratt and her sister-in-law Louise Pratt seen here on the right pulling their sled back up the hill about 1913 or 1914. In the second photo, the two women (with Louise Pratt in front) speed down the hill, the delight on their faces evident in the view. Louise Pratt who was noted for her love of winter sports is said to have owned the first pair of skis in Middleborough which she used on the gentler slopes of Pratt Hill on East Main Street. On several occasions, when winter roads were made impassable by snow, Louise Pratt would make her way from her home at the Pratt Farm to her job at the Middleborough Public Library on snow shoes. Later, following 1928, the Indian Hill property was owned by the Maddigan family and the rocky pasture continued to be used in winter for sledding by members of the family, including the author who recalls the course as particularly fast and bone-jarring. Rose Standish Pratt and Louise Pratt (and two unidentified girls), Indian Hill, Middleborough, MA, photograph, c. 1913-14. Rose Standish Pratt was an avid amateur photographer and it is likely that she brought her camera along on the sledding outing. It is also likely that it is her husband, Ernest S. Pratt, who took the photographs of his wife and sister. Louise Pratt and Rose Standish Pratt, Indian Hill, Middleborough, MA, photograph, c. 1913-14. 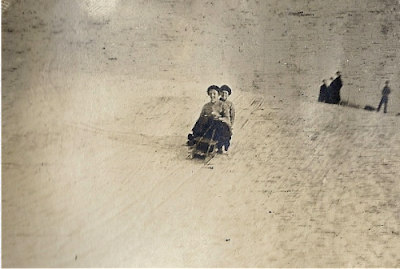 This photograph is unique for capturing the action of the sled down the slope of Indian Hill. A third photograph from the series depicting Louise and Rose Standish Pratt at the crest of the hill was previously posted and may be viewed here).